We must say, it’s worth the silly efforts by Diet Prada for the new model or ‘Rihyoncé’ looks gorgeous! deVogue has made sure it remains in news this autumn-fall and how! 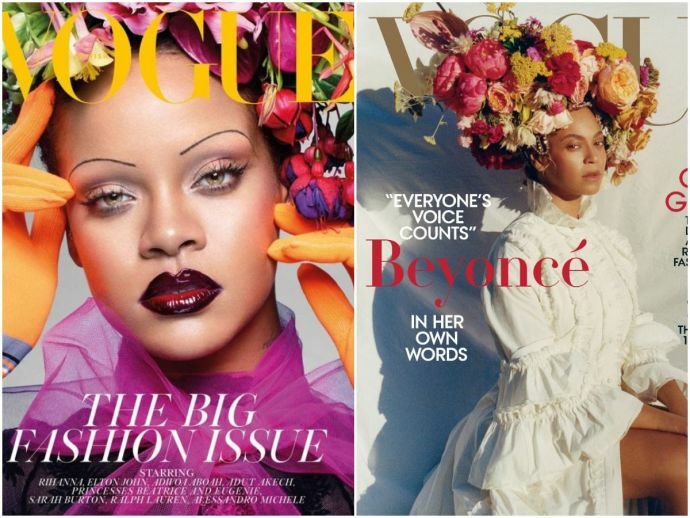 While the Indian issue chose the put “the struggling star kid” Suhana Khan on its September cover, Vogue USA upped the game with Beyoncé and Vogue UK chose to go ahead with Rihanna. And then we say why India’s fashion game isn’t strong. Somebody call up Kangana Ranaut for the answer please! Anyhow, that story can be left for new articles all together and coming back to why we gathered here today. Despite of both the covers being replete with achievements in their own way, it left fans of Riri and Queen Bey with a bitter taste in their mouths. The two camps ended up fighting over which cover was better given for the fact that both the dark-skinned divas chose the same pose and adorned themselves with the same kind of flower crowns. Instagram’s famously infamous account ‘Diet Prada’ chose to end the feud by coming up with their own recommendation for the September cover. They paid tribute to both the stars by merging their faces and creating an all-new model for the two camps to unianimously look up to. All hail, DP! The new model has Rihanna’s nose and luscious pout, as well as Beyoncé’s eyebrows and powerful smize. And we must say, it’s worth the silly efforts by Diet Prada for the new model or ‘Rihyoncé’ looks gorgeous! The Instagrammer captioned it as “Best September ever” and we second it. In fact, it royally beats the Trump and Putin mega alter ego done by the TIME magazine! As for Vogue India, all I can sing is ‘Wake me up when September end’.